A hearty crew of Goodwill staff and volunteers! I could not have said it better myself! 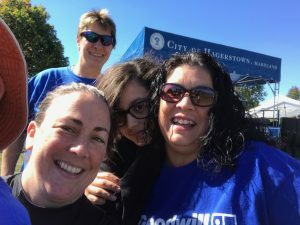 After spending last Sunday October 1st representing Horizon Goodwill at the 2017 Hagerstown Hispanic Festival, “an atmosphere of hope and self-improvement” is spot on and perhaps needed today more than ever. If you haven’t been to the this festival, you are absolutely missing out on one of the most enriching celebrations of community and culture that I have ever experienced. For those of you who have attended, you know what I am talking about. 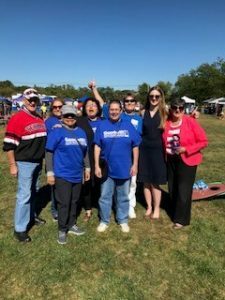 Organized by the Hispanic Association of Hagerstown, the Annual Hagerstown Hispanic Festival is a daylong celebration that includes live music, community resources, and vendors, and is designed to celebrate and share Hispanic culture with festival goers. Numerous organizations man booths and tables to people about opportunities in health and education. Vendors sold cultural food, clothing and wares. Goodwill’s Board Chair Ron Bowers connecting us w/ Caitlin M Ainge from Representative Delaney’s office & Julianna M Albowicz from Senator Van Hollen’s office. Diana Reyes, president of the association, and Sila Alegret-Bartel, vice president, remarked Sunday about how vendors and major sponsors of the festival have steadily increased. “Our country is divided right now, and I think we’re just at a time when we want to celebrate our culture in a positive way,” said Reyes as hundreds of people walked, danced and played around the festival grounds. Our Goodwill Assistant Career Assessment and Evaluator, Carla Stickler invited her close friends to volunteer and along with Goodwill’s very own Americorp member and Salisbury University intern, Delores Agrinzonis – these strong and wonderful woman shared Goodwill’s mission of removing barriers and creating opportunities with attendees representing so many cultures and using so many different languages. A big thanks to this group of volunteers and staff for all they did to help Goodwill remove the barrier of languages! The crew: Carla and Dolores! “We’re all volunteers. None of us get paid,” said Alegret-Bartel, who is president of International Corporate Training & Marketing, a Hagerstown-based company that offers, among other things, translation and interpretive services in 16 languages, as well as Hispanic marketing. Sila Alegret-Bartel is originally from Cuba and moved to the United States in 1966. 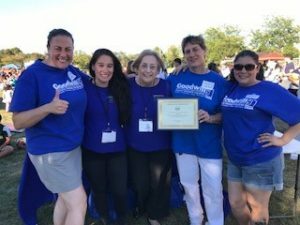 She believes that life is steadily improving for Hispanics in the Tri-State area. The region’s population is becoming more diverse and the Hispanic population has been playing a significant role in the growth of minority populations in the area, she said. When I met with Sila Alegret-Bartel a few months ago, she briefed us on the event. It is always held around the time of National Hispanic Heritage Month, which is celebrated every year from Sept. 15 to Oct. 15. She explained that the proceeds from the festival have funded over 40 scholarships for Hispanic students continuing education after high school. Supporting students and their families aligns with Goodwill’s vision of working together so all community members can realize and achieve their fullest potential. Honored to be a part of a great day! Hanging with Pres and VP of Hispanic Association of Hagerstown. 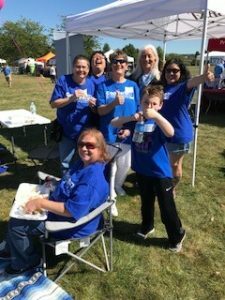 Booths at the festival offered people guidance and help with a variety of issues, including medical testing and educational opportunities. 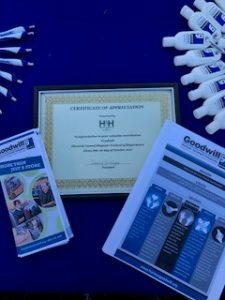 And, Horizon Goodwill is proud to have been among them. 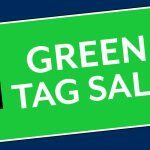 If you have suggestions on how we can learn more and do more for the Hispanic communities and families, please email me at cfleming@goodwill-hgi.org. As always, follow us on Facebook and Twitter, and check out more of our website.